The gemologists at deBebians are always expanding our Bel Dia collection with new designs. We gather our ideas from a wide range of places: auction/estates, celebrities, and classic designs that we know will never go out of style. One area that I pay close attention to is celebrity engagement rings since these are the people that I look to for new styles and trends. Young Hollywood starlets are daring in their tastes of jewelry, their engagements rings are of no exception. This blog will be dedicated to a new trend in engagement rings, which includes mixing diamond cuts, such as step cut and brilliant cut diamonds in the same ring. Kristen Cavalari got engaged to football pro athlete Jay Cutler with an Asscher cut diamond on a tapered round brilliant cut diamond channel set band. The mounting features a channel set shank, iconic of more traditional ring designs. Unlike many celebrity engagement rings, Kristen opted to not have a halo. Her center Asscher is held by four single prongs. An Asscher cut diamond is square in shape and requires precision in cut and clarity. These features are unique and require appreciation for symmetry and simplicity. The ring combines modern and antique elements with a more contemporary cut center diamond in a more traditional style mounting with brilliant cut round diamonds. 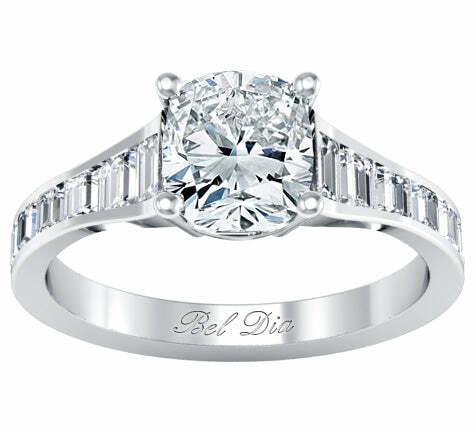 Our Bel Dia style HE328 has similar features to Kristen’s ring except we designed it in the reverse. We decided to build the shank of the ring with channel set tapered baguettes, giving that modern structured feel. This ring is a flush set design so a matching channel set baguette diamond band is ideal. Since the majority of our customers prefer a princess cut or cushion cut center diamond, we decided to feature the ring with brilliant cut fancy shaped center diamonds (although all of our rings can be manufactured to any diamond shape). The striking contrast of a brilliant cut center stone with step cut accenting side stones is becoming the new trend in bridal jewelry. deBebians is already aware of this and working on new designs featuring these kind of diamond combinations. Sometimes it is overwhelming to see so many different engagement ring styles, but this is what we at deBebians take pride in. We don’t want out customers to settle, we want to make them their dream ring. For those of you who like multiple diamond cuts, I encourage you to ask deBebians staff members how you can incorporate that into you ring. Feel free contact any of our staff gemologists for any recommendations on matching different diamond shapes.